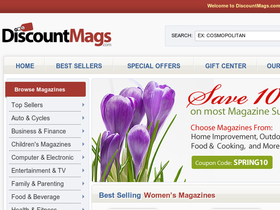 For all your magazine subscription needs, shop at Discount Mags, online at DiscountMags.com. The categories of magazines offered at Discount Mags is endless. Some of these categories include women's and men's magazines, health and fitness, family and parenting, en espanol, lifestyle, music, religion, home and garden, entertainment, and so much more. Find top-selling magazines such as ESPN, Wired, US Weekly, Men's and Women's Health, Maxim, Weight Watchers, Car and Driver, and the list continues. Check RetailSteal.com for all the best Discount Mags promotions, Discount Mags coupons, and Discount Mags discounts. 100% unconditional moneyback guarantee if you are not satisfied with your subscription. Discount Mags guarantees the lowest publisher price available and no hidden fees. Use this coupon code today to save 20% off your entire order from DiscountMags. Check out DiscountMags.com for up to 70% off cover prices for your favorite magazines including Us Weekly, Shape, Taste of Home, and more. Check out Discount Mags online for their latest special offers. Shop online at Discount Mags and enjoy free shipping and no auto-renewal. Click here to shop. Shop at discountmags.com and get value bundles starting at just $18.99 for 24 issues. Shop online at Discount Mags and save $32.88 on 12 issues of Bon Appetit magazine.